BARCELONA, Spain — The back-to-back vehicle attacks in Barcelona and a nearby resort had been planned for a long time by an Islamic terrorist cell — and could have been far deadlier had its base not been destroyed by an apparently accidental explosion this week, Spanish officials said Friday. Police intensified their manhunt for an unknown number of suspects still on the loose Friday. They shot and killed five people early Friday who were wearing fake bomb belts as they attacked the seaside resort of Cambrils with a speeding car. Police also arrested four others believed linked to the Cambrils attack and the carnage Thursday on a famous Barcelona promenade. The number of victims stood at 13 dead and 120 wounded in Barcelona, and one dead and five wounded in Cambrils. 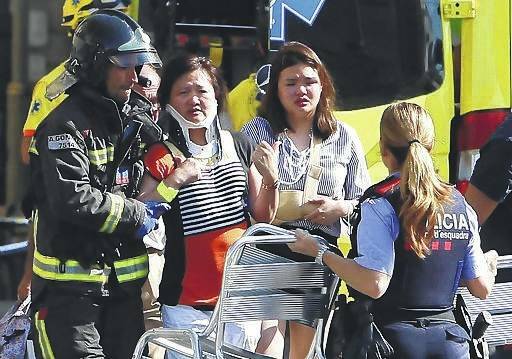 Sixty-one people wounded by the van in Barcelona remained hospitalized on Friday, with 17 of them in critical condition. Authorities said the two attacks were related and the work of a large terrorist cell that had been plotting attacks for a long time from a house in Alcanar, 200 kilometers (124 miles) down the coast from Barcelona. The house was destroyed by an explosion of butane gas on Wednesday night that killed one person. The Islamic State group quickly claimed responsibility for Europe’s latest bout of extremist violence, in which a van roared down Barcelona’s historic Las Ramblas promenade on Thursday. Hours later, a blue Audi plowed into people in the popular seaside town of Cambrils. Spanish Prime Minister Mariano Rajoy declared Friday that the fight against terrorism was a global battle and Europe’s main problem. Police said they arrested two more people Friday, after an initial two were arrested Thursday — three Moroccans and one Spaniard, none with terrorism-related records. Three of them were nabbed in the northern town of Ripoll. Another arrest was made in Alcanar. “We are not talking about a group of one or two people, but rather a numerous group,” regional Interior Ministry chief Joaquim Forn told Onda Cero radio. “We are not afraid! We are not afraid!” the crowd chanted in Catalan and Spanish. Authorities were still reeling from the Barcelona van attack when police in the popular seaside town of Cambrils, 130 kilometers (80 miles) to the south, fatally shot five people near the town’s boardwalk who had plowed into tourists and locals with their car. Forn said the five were wearing fake bomb belts. The Cambrils attack came hours after a white van mowed down pedestrians on Barcelona’s picturesque Las Ramblas promenade, leaving victims sprawled across the street, spattered with blood and writhing in pain from broken limbs. Others were ushered inside shops by officers with guns drawn or fled in panic, carrying young children in their arms. “It was clearly a terror attack, intended to kill as many people as possible,” Trapero said. The Islamic State group said on its Aamaq news agency that the Barcelona attack was carried out by “soldiers of the Islamic State” in response to its calls for followers to target countries participating in the coalition trying to drive the extremist group from Syria and Iraq. Islamic extremists have systematically targeted Europe’s major tourist attractions in recent years. Rented or hijacked vehicles have formed the backbone of a strategy to target the West and its cultural symbols. Barcelona’s Las Ramblas is one of the most popular attractions in a city that swarms with foreign tourists in August. Citing police sources, Spain’s RTVE as well as El Pais and TV3 identified the brother, 17-year-old Moussa Oukabir, as the suspected driver of the van. Forn declined to respond to questions about him Friday. “We don’t know if the driver is still in Barcelona or not, or what direction he fled in,” Forn told SER Radio. At noon Friday, a minute of silence honoring the victims was observed at the Placa Catalunya, near the top of Las Ramblas where the van attack started. The presence of Spain’s king and prime minister alongside Catalonia’s regional authorities marked a rare moment when the question of Catalonian independence — the subject of a proposed Oct. 1 referendum — didn’t divide its people. Since the Madrid train bombings, the only deadly attacks in Spain had been bombings claimed by the Basque separatist group ETA that killed five people over the past decade. It declared a cease-fire in 2011. “Unfortunately, Spaniards know the absurd and irrational pain that terrorism causes. We have received blows like this in recent years, but we also know that terrorists can be beaten,” Rajoy said. Injured people are treated Thursday in Barcelona, Spain after a white van jumped the sidewalk in the historic Las Ramblas district, crashing into a summer crowd of residents and tourists and injuring several people, police said.